Studs for the tins is a great idea!! One of my first jobs working for my dad, installing studs on valve covers of water cooled volkswagens to prevent leaks. Did you use studs for the T-case halves? Or all thread cut down, double nutted to install and bottomed out in the holes? Hard to tell from the pics as I dont see a clear thread relief. Those are 2" studs that were set to depth with a set tool. I finally received the star washer that they sent the wrong one. Anyway it's in and I will fill the xf case tomorrow. I did get both diffs done so they're ready to go, just got to lube up the driveshafts and install them. Let us know how the tcase shifting goes after it's all installed. Can't tell, but did you do the 6 gear planetary, or stick with the stock 3 gear one? I should rip my case apart and add the 2 low. Already have the wide chain and 6 gear in it. It's a 5 gear planetary, 16 yrs ago I installed the Tera 4:1 front case. I wished I had done the 2lo and the wide chain then! All is good so far, no leaks (knock on wood). The shifter pattern is not off by much, I expected it to be more. So I've been driving slow until I get it all oiled up, I assemble it all dry to insure a good bond on the sealers. I'll report on the brakes in my other thread. Well I've developed a leak. It's the front yoke seal and because of the slinger I can't see if it's the ID or the OD. I didn't see anything unusual with the yoke and I have double/triple checked the part#(710046) for proper fitment. So in order to not "f***" around with this and not taking it apart, I ordered a new Timkem seal and a new yoke. 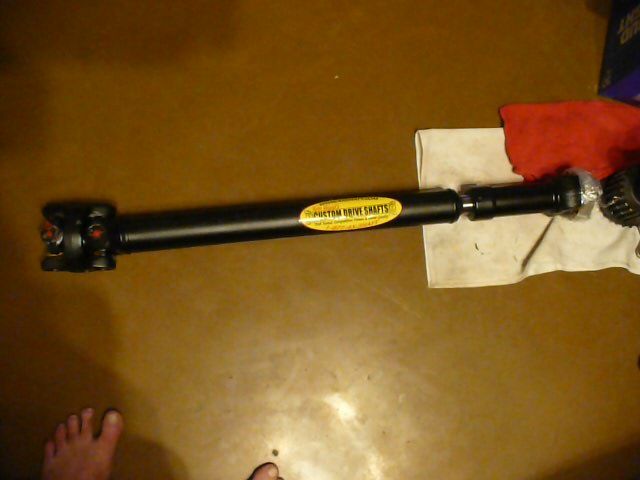 Although my 18+ yr old front driveshaft(only grease fitting on the slip yoke) never gave me any problems, I also ordered a TW driveshaft! I received my yoke yesterday and the seal today, I panted the yoke and de-burred the seal edge. The new Timken seal feels a lot better than the Nation seal did on my output shaft(and they all measured the same). My TW shaft will be here tomorrow so the games on then! I got my Woody today! I'm running the factory shifter assembly. All times are GMT -7. The time now is 16:24.